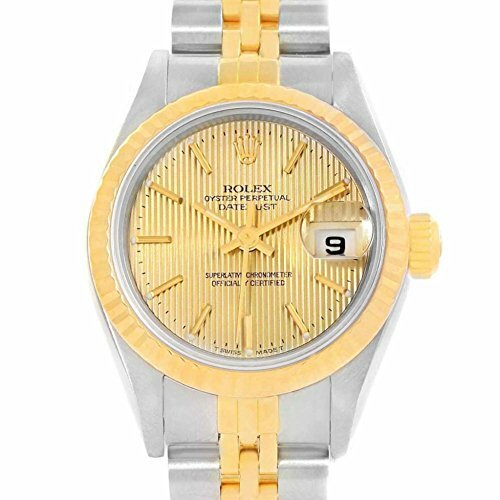 Rolex Datejust 26mm Steel Yellow Gold Linen Dial Ladies Watch 69173. Officially certified chronometer automatic self-winding movement. Stainless steel oyster case 26.0 mm in diameter. Rolex logo on a crown. 18k yellow gold fluted bezel. Scratch resistant sapphire crystal with cyclops magnifier. Champagne linen dial with applied gold baton hour markers. Date calendar at 3 o'clock aperture. . Stainless steel and 18k yellow gold jubilee bracelet with fold over clasp. Fits 6 3/4" wrist. .. SKU 15590. Buy with confidence knowing each timepiece goes through the same rigorous 31-point inspection. Rest assured only authentic parts straight from the manufacturer are used. The Certified Pre-Owned Program on Amazon ensures peace of mind and transparency via standardized reports and a 1 Year Warranty Provided by WatchFacts.